HARRISONBURG, VA. — James Madison knew the road to the defending its Football Championship Subdivision title would be arduous, but the top-seeded Dukes didn’t just how tough it could be until they survived a quarterfinal test from Weber State Friday at Bridgeforth Stadium for a 31-28 victory. 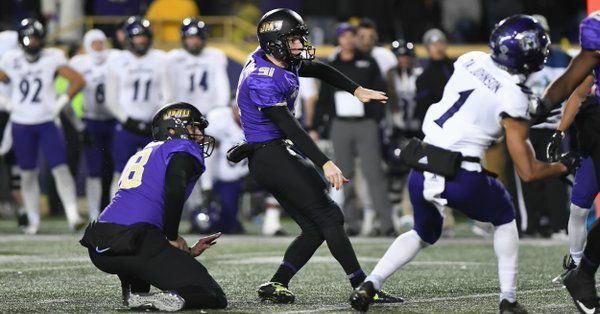 Ethan Radke’s second field goal of the final period from 46 yards as time expired barely snuck between the goal posts inside the right upright on the last play of the game to finish off a wild comeback for the Dukes (13-0). Trailing 28-20 in the fourth quarter, JMU appeared on the ropes before rallying for 14 points in the final eight minutes of play to advance next weekend’s semifinals and win its 25th consecutive game with an ESPN2 television audience watching on. Quarterback Bryan Schor tossed a 40-yard bomb to Riley Stapleton with 2:08 left and Trai Sharp dashed into the end zone for two points to tie the game at 28. After holding the Wildcats on downs and forcing a punt, Schor (21-of-45 and 359 yards passing) moved his team from its own 26 to the WSU 30 in 65 seconds to set up Radke’s second field goal of the quarter with only one second left on the clock. Weber State (11-3) dominated the powerful JMU attack with strong defensive line play for the first three stanzas and took a 14-10 lead into the final 15 minutes before the Dukes finally caught fire. The Wildcats struck early when Xequille Henry intercepted a Schor pass on JMU’s first drive and returned it 40 yards to the Duke four. Kevin Smith pounded in from a yard out two plays later to give WSU its quick 7-0 lead. James Madison equalized on the next drive with Marcus Marshall (128 yards rushing on 14 carries) racing 43 yards to set up his 15-yard TD burst, but the Dukes were limited to Radke’s 35-yard field goal in the second quarter for their only other points until the fourth period. Leading 10-7, JMU dodged a bullet at the end of the first half when Jonah Williams blocked a 36-yard attempt by Rake. Henry scooped up the loose ball and returned it to the end zone for an apparent Wildcat score, but Williams was called for an illegal block on the play to negate a touchdown and a WSU lead. Weber State finally took control again in the third period when quarterback Stefan Cantwell found Smith for an 81-yard scoring connection to make it 14-10. JMU couldn’t answer until the fourth quarter when Schor hit Terrence Alis for 29 yards and Marshall broke loose on the next play for a 20-yard score. The resilient Wildcats had a quick answer again when Rashid Shaheed dashed 33 yards with the kickoff return, Smith rumbled for 24 yards and Cantwell threw a 36-yard strike to Drew Batchelor. That led to Cantwell’s one-yard TD blast and WSU was back on top, 21-17. After JMU pulled to within one on Radke’s second field goal of the night, Weber State made it an eight-point game when Cantwell (12-of-30 for 238 yards passing) lofted a beautiful 36-yard aerial to Batchelor for the Wildcats’ last score of the night with 3:14 on the clock. But those final three minutes plus were just enough for the Dukes to pull out another win. James Madison will face the winner of Saturday’s New Hampshire-South Dakota State showdown in Brookings, S.D. with the date to be announced.